Oh my gosh, the month has flown by!!! This is the last day to purchase any items on the Last Chance List. Many are discounted in price too. Go to my website, then click shop now and then Last Chance (link on the left). There have been problems with Blogger/Blogspot for me since last night. Keeping this post short and with not photos. REMINDER: From midnight tonight till noon tomorrow, you will be unable to purchase on-line thru Stampin' Up! websites. They are going thru the transition of updating all the new products on the websites for all of us. On my blog the other day I showed you some dyed rhinestones, today I would like to share with you what I created with them. I have been busy making a scrapbook for my nephew using My Digital Studio (MDS). I printed these pages at home and then put the pages in a ready made album. 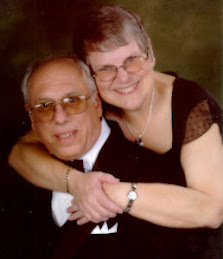 I have cut off part of the photo albums as there were photos of family members that I do not have permission to post here. This way though you can see the layout idea. My Digital Studio (MDS) downloads for June 28th. Why settle for clear rhinestones when you can dye them yourself using a Sharpie Permanent Marker!! These will be perfect for adding sparkle to your card or scrapbook page. Also a great way to create a birthday card with birthstones on it. 1. Purchase Jewels-Basic Rhinestones (item #119246). 2. Decide which color(s) of gemstones you want. 3. Using the Sharpie, color the top and sides of the rhinestones. You can leave them on the mat that the rhinestones are adhered to. If you do this step while the rhinestone is on your card, you take the chance of marking up the card. Remember that the pearls & rhinestones are self-adhesive, so working with them on the mat makes it much easier to store them on till needed. The rhinestones come 150 to a package. There are 50 each of 3 sizes: 5mm, 4mm, and 3mm. You can also dye Jewels-Basic Pearls, item # 119247 using the same procedure. With summer upon us, I have decided to take a bit more time with my family and friends. My posts will be during the week (Monday - Friday), no longer on the weekends unless I find extra time. I will still try to post daily Monday - Friday. I'm still here, I'm still posting, I'm not leaving. If you sign up for e-mail subscription (link at towards the top of the blog), you automatically receive notification every time I update my blog. The posts are sent directly to your e-mail account. It a great way to keep up to date. 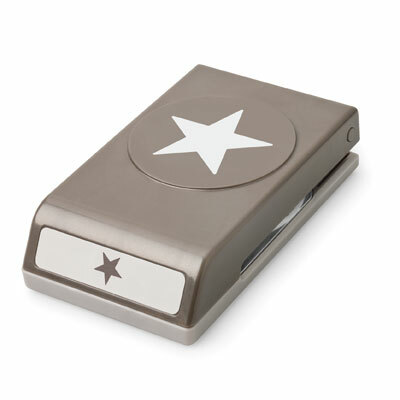 I am anxiously awaiting the premiere of the new 2011-2012 Stampin' Up! catalog on July 1st. As a demonstrator, I was allowed to purchase a few things early. There is so much more I want to purchase and share with all of you. This new catalog is fantastic. My catalogs to my customers have already been mailed out. Anyone that made a purchase thru my website or me from July 1, 2010 thru the end of June 2011 automatically receives a FREE copy. This is a personal promotion from me, not one sponsored by Stampin' Up!. Please remember there are only a few days left till the 30th. Last chance items/retired items are available while supplies last. Many are discounted. Don't miss out on these great products. You may order from my Stampin' Up! website 24/7 by CLICKING HERE, then click on Shop Now or by contacting me directly. My e-mail link is at the top of the screen. The openings on the Doily image that is punched out using the Triple Layer Punch is perfect for weaving the 1/8" ribbon that Stampin' Up! carries. The openings on the doily are top, bottom, left and right. Personally I like to run the ribbon over the top of the opening, down thru, behind the doily and then back up and over ... repeating as you secure the designs together. The doily above has a small circle in light pink circle behind the center rather than have the ribbon show thru. The openings as you weave the ribbon will actually fit right into each other. 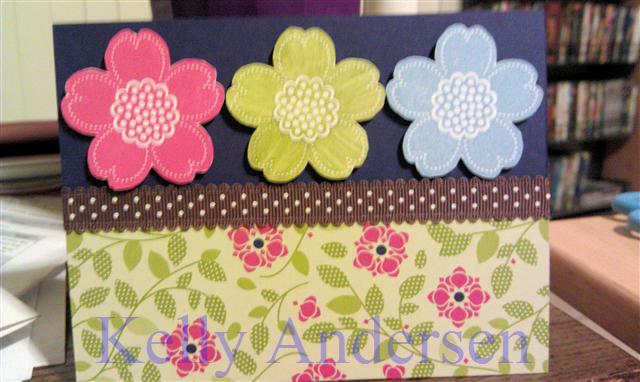 I like that effect or you can space them and make them more separate before attaching to the card stock. Card is a standard A2 card (4 1/4" x 11"). Night of Navy piece is 2" x 5 1/2"
Four of the doily punched images are a perfect fit for a 5 1/2" area. When you purchase 8 1/2 x 11 Whisper White or Very Vanilla Card Stock, you will receive 40 sheets in the package. Other standard colors of card stock have 24 sheets. There is a slightly higher price for the Whisper White & Very Vanilla Card Stock because of the additional sheets of paper. Here's my latest creation using the Doily Triple Layer Punch. More details about it tomorrow. I had so much fun ribbon weaving the Doily Triple Layer Punch together with ribbon. Then I accented with the Boho Blossom Punch and Jewels: Basic Rhinestones and Basic Pearls. Did you know that you can actually dye the rhinestones and pearls with Sharpie markers??? That's what I did with the rhinestones on this card which created the pinkish color. The rhinestones retain their sparkle too. I really prefer the pearls in their natural color, but you could color them also with a Sharpie. June 21, 2011 There were three items inadvertently left off the Last Chance lists; item numbers and prices are listed below. We apologize for the oversight. In addition, the Days to Remember 6" x 6" Calendar (item 104144, p. 170) is no longer available for purchase and will not be part of the 2011-2012 product offering. To see remaining Last Chance Items, go to my Stampin' Up! website then click on Shop Now then click on Last Chance (left side). Does the design of the card look familiar? It is created using the card map from yesterday on my blog. Did you notice the tiny pearls in the middle of the punched designs AND on the ship wheels too? Teeny Tiny Wishes Stamp Set is a set of 24 sentiments. It is a perfect fit for both the Word Window Punch and the Modern Label Punch. When someone asks me which stamp sets I think they would get the most use from, this is right at the top of my list. Personally I use it a great deal plus it is one set that I use often in my classes. Today I thought it would be nice to share a card map with you. I hope it will get your creative juices flowing. I used MDS (My Digital Studio) to create it. Use this map as a guideline to create a card on your own. One layer is Summer Splendor DSP (MDS), but you can use any design card stock you want. The left side is a card stock panel in a complimentary color. 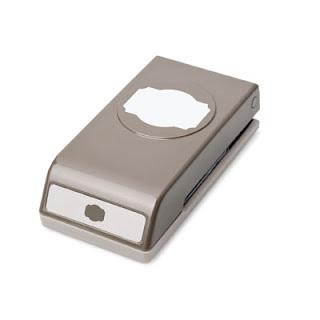 The sentiment is done with the Word Window Punch and the Modern Label Punch. The panel is embellished with a series of stamped designs floating down, but you could use brads, ribbons, buttons, or whatever you want. Again, remember this is just an idea ... a map. Something for you to make your creation from. three sizes of card stock used: 4 1/4", 4 3/4", and 5"
Calypso Coral and Wisteria Wonder on the 5" square. I used the new paper punch called Lace Ribbon border, item #122362, to create all of these frames. The first two (smaller sizes) actually cut out the center piece. The 5" square did not. The last one (two tone) was mounted after punching on a magnet sheet, item #119816. Thought it would be a perfect mounting for a special photo. The center area measures: 2 1/2" x 2 1/2". Nice gift idea too that would be easy to mail as it is flat. I think this is such a fun and cheerful card to say Thanks to someone special. The triangle and scalloped accent pieces were made with the new Big Shot BigZ L Die called Perfect Pennants, item #123126. I really like how they can be layered on each other to create a unique look. The center design was created using my Big Shot Die Cut Machine (item #113439) and the new Sneak Peek die called Perfect Pennants (item #123126). I layered the two circle scallop pieces and accented with Bakers Twine (white - item #124262). I held the twine with a pair of tweezers on the classic ink pad while I was coloring with a Stampin' Write marker. The color can be changed to whatever color you would like. Just allow to dry a bit before adding to your card. The center stamped design is from one of the new Hostess Rewards Stamp Sets called Tagtastic and is a 6 stamp set. I think this set is going to be in high demand with our hostesses and customers placing qualifying orders. Lots of layering on this card. It was so easy too using the Perfect Pennants BigZ L Die from Stampin' Up!.The DSP is Just Add Cake, item #124339. Just a reminder that anyone placing an order by the end of the month thru my website (or who have placed an order thru me since July 1, 2010) will automatically receive a FREE copy of the new Stampin' Up! 2011-2012 Idea Book & Catalog. 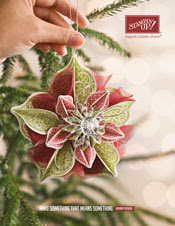 You still have time to order to receive your FREE catalog. It will ship from me, it will not be in the order you receive from Stampin' Up!. The card base is Lucky Limeade (item #122926). The designs on it were made using Versamark Ink (item #102283) and the Delicate Doilies Stamp Set (item #122590 - Wood OR item #122592 - Clear Mount). Versamark is clear when stamped. 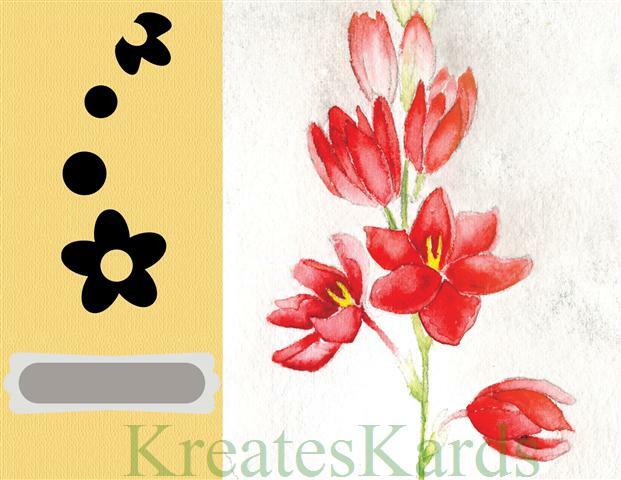 On our light to medium shade card stock, it will make the design a bit darker giving it a watermark look. The center design was created using my Big Shot Die Cut Machine (item #113439) and the new Sneak Peek die called Perfect Pennants (item #123126). I layered the two circle scallop pieces and accented with Bakers Twine (white - item #124262). I threaded the twine thru the openings and tied a bow at the top. The center stamped image is from one of the NEW Hostess Rewards Stamp Sets. It is called Happiest Birthday Wishes and has a set of 11 stamps in it. LOVE, LOVE, LOVE the new In Color called Wisteria Wonder. I can see it is going to get a great deal of use at my house and at my classes..
Another favorite new product is the Lace Ribbon Border Paper Punch, item #122362. I used to for the accent down the middle of the card AND also on the sides. The border is glued underneath on the sides to give it that lacey look. Do you remember Paisley Petals (item #122367) Designer Series Paper? We sold it a few months back as a special. It's now in our catalog that will premiere on July 1st. I love this DSP. I accented it with Paper Daisies (item #119243). The Paper Daisies are all white. I used an Aqua Painter Pen (item #103954) and classic ink refills to color them in. Then also used a sponge and sponge in a bit more color to darken the 1st & 3rd layers. Center is a white brad (item #119736 - Neutrals Brads). Brand new MDS (My Digital Studio) downloads are available today. Many new designs for MDS such as paper buttons, save the date template, and so much more. On the 1st of June, Stampin' Up! announced items that would be retired/last chance list. Please realize these items are only available while supplies last. If there is a paper punch, embellishments, Designer Series Paper Pack etc that is on this list; it may not be there when you order if you wait too long. Many of the products are on sale too, so a great opportunity to buy products you want and need plus get a discount on some of them too. To order, go to my website then click on shop now, then click on Last Chance on the left side. Have fun. Hope you find the items you are looking for. Contact me if you have questions too. Isn't this a beautiful card created by Kelly Andersen. Kelly is one of my Stampin' Up! team members. She sent me the photo of her card the other day, and has given me permission to share it with all of you. I can see that I'm going to have to add this stamp set and DSP on to my wish list. Thought this would make a bright and cheerful Thank You card. On this card I used two of the laser cut doilies from my package of DSP (Designer Series Paper). Thank you Stampin' Up! for giving us another shade of purple in our line of colors. I love purple, so this I'm sure will be one of my favorites in the months to come. The card base was made with the new In Color called Calypso Coral. Then the lace border uses the new In Color called Pool Party. My Digital Studio Downloads for June 7th, 2011 are HERE. I would like to thank Lynn Pratt for posting this list. It is so helpful to have photos along with item numbers and names. Remember all items are while supplies last. 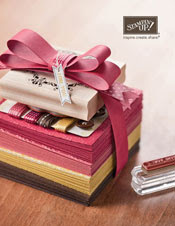 Are you as excited as I am about the new catalog that premieres July 1st for Stampin' Up! The 2011-2012 Stampin' Up! Idea Book & Catalog will be valid from July 1, 2011 thru June 30, 2012. 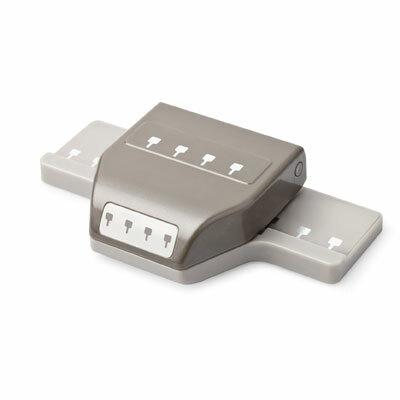 It is our main catalog which is supplemented with our mini catalogs three times a year. This week my focus will be the five new In Colors. They are considered are 2011-2013 In Colors. The In Colors in our current catalog are the 2010-2012 In Colors. Starting next year 5 new ones will be presented as 5 retire. Each set of In Colors will be in our catalog for 2 years. 2010-2012 In Colors: Peach Parfait, Poppy Parade, Pear Pizazz, Concord Crush, and Blushing Bride. 2011-2013 In Colors: Pool Party, Calypso Coral, Lucky Limeade, Wisteria Wonder, and Island Indigo. These are the BEST kitchen magnets. They really have great holding power. I know I will be making many more as gifts. 1. Gems: If you are looking for the "gems" I used, you will find them in most floral depts of the larger stores. These are about 1 inch to 1 1/4 inch round, have an iridescent shine/glaze to them. The front of the gem is rounded like a stone, and the back is flat. These gems are not uniform in shape/size but all are rounded. I purchased a two pound bag and it gave me over 40 gems to use. Carefully look over the gems before you purchase the bag. I believe they are a form of glass and in many of the bags, they had cracks/chips. When we got home, I ended up throwing out about 4 of the gems because they had some major imperfections in them. These gems are inexpensive ... about $3 for the bag if not on sale. 2. Magnets: I purchased a package of fifty 3/4" magnets with a strength level of 6. The retail on this was about $7 if not on sale. You want to be sure you purchase craft/ceramic magnets. I did try these with the magnet sheets we sell. The magnet with gem did hold to the refrigerator as long as it was for decoration not to actually hold something. The level 6 strength magnet is GREAT, definitely will hold items to display. 3. Glue: It is extremely important to use a clear drying glue as the punched image or stamped image is glued directly to the gem. The perfect glue type solution is sold by Stampin' Up! and is called Crystal Effects. It comes in a 2 oz bottle and is acid free. It is item #101055 and is $6.25. I put a small amount on a piece of foil then brushed with a paint brush (small flat) onto my image then put the image on the flat/backside of the gem. Wash the paint brush with soap & water to clean. Crystal effects dries quickly. Other card stock of choice to back the magnet with 1" circle and also to back the blossom. Brush Crystal Effects onto the back of the glass gem, immediately attach stamped image. Put Crystal Effects on one side of the magnet, then put on back of stamped image. IF magnets hook together, leave them and let the glue dry. If you try to pull apart while wet or tacky, it can ruin your stamped image. Time for another tutorial ... I think this card is really cute and could be used for many different occasions. 1. Score the 5 ½” x 8 ½” piece of Whisper White Cars Stock at 4 ¼”. Crisply fold. a. Attach ribbon to the smaller piece – attach ribbon to back with scotch tape, then tie knot type bow. b. Using SNAIL, attach larger piece to card base matching right side of card. c. Attach small piece of DSP on the left side (some will overlap on the piece below) with sticky strip. 4. Ink the teacup stamp with Concord Crush & Cherry Cobbler Stampin’ Write Markers, then stamp on Whisper White 4” Square. a. Punch out with Scallop Square Paper Punch. c. Attach to card front with dimensionals. c. Using a small amount of adhesive, glue Very Vanilla Tag and White Vellum Tag at the very top. DO NOT GLUE THE WHOLE TAG. Glue shows thru the vellum. i. Attach to top of tea bag aligning straight lines. iii. Use linen thread to knot and tie bow. Did you notice that a number of the paper punches are now on the Last Chance list that was shown yesterday on my blog? Oh my gosh, I love paper punches and it's going to be hard to say goodbye to these ones. Remember all Last Chance items are sold only as long "as supply lasts". Don't miss out on these if it is a paper punch you have wanted. The Bitty Bat and the Cogs Double Punch are on sale too. If you go thru my blog, you will see that I have used these punches many times. So there will be lots of samples for you on most of them. Again, the above punches are on the Last Chance/Retired list. They will only be available while supplies last or until the end of June. Yes, it is sad to see these paper punches go .... HOWEVER, I can promise you Stampin' Up! has some amazing new ones in the new 2011-2012 Idea Book & Catalog that will premiere July 1st.